Walked down to the plot today, just to see what difference a couple of days had made if at all. Needless to say, it hasn’t. It was dry today, or at least I think it was; the little that I saw of the day having been inside for the most part. All that is missing really, is perhaps a couple of gold fish, a frog, a rubber ducky. Watching the news as I speak, the newsanchor suggests that the precipitation will continue into next week and there is possibility of the white stuff also descending. Well, they always say that at this time of the year. Apparently, 93mm of rain fell over the weekend. That would make sense, given the level of water that seems to be just sitting there on the plot. This flooding business may only get worse.. The wendy house, a former shadow of itself, stands there all skeletal looking. I would just it to be dry for a spell. Dry. I don’t mind cold. But dry, and lack of precipitation perhaps. I’ve attached the links as I have yet to figure out how to put videos and things in. It is somewhat perilous just getting to the plot. The red wellingtons squelched some what in making my way to the plot. As you get closer and closer to plot 2a, the surface underfoot becomes muddier and muddier. It is difficult to stop sliding around and not ending up one’s backside. I met another plot holder as I left. He had a story to share, given how I had shared my excess of onion sets with him. He had sunk them, as you do. Only for evil squirrels to dig them up, bite the bottom and then rebury them. This is apparently what the critters do with acorns and such like. When it comes to my own plot; something is growing. Something has sent up some green shoots. There are a couple of green shoots belonging to broad beans. Easily recognisable with the big, wrinkly leaves and stout shoot. The shoots of the onions and garlic are quite slender in comparison. All is not lost, just a bit of it. Perhaps some rescuing could be done in the Spring. Though this spring, putting in onions at the point didn’t really work; or the onions for that matter. Even so, it was from the spring that we had the start of this years miserable freak weather. The sogginess is just as demoralising as not having a productive plot. I have been advised to move; but I really don’t want to. Having worked so hard on this one, I’d like to see all that hard work pay off. Sat at home, is the pot grown Reuben Blackberry. Hardy as it may be, I’m not sure about sinking it into wet clay. In addition, raspberry canes are expected at some point. Have invested in a pot making device; you know the sort, the little wooden things that you wrap newspaper around. If ever you need a fluke to make you feel good. This was most certainly it. The first of many things that I did when obtaining a half plot was plant garlic. It seemed easy to do, and why not? For one l clove you got a fairly decent return. Garlic, shallots and onions were planted, all in the chilling cold, usually as dusk fell after school. And then I left them all to the own devices. It was quite nice really, to see the crop develop. Thick stalks, all stood sentry. All very straight backed and regally regimental. So it all remained, until late may, june. I had mulched at one stage, and fed as well. I don’t think I fed the alliuems more than once perhaps twice. I really did leave them to their own devices. A fact evidenced by a lot of grass growing in the beds, and the rain had in fact caused the clay to eat some of the shallots-in fact, most of the shallots, to be honest with you. What you see above, is the crop drying. Was sat in the garage for a number of weeks drying out. The twenty or so cloves, formed twice that many bulbs. A lot of it was given away! There were many positive reports, in that it lasted longer and tasted different. Good old pops, got fed up with the garlic and onions littering his garage. So decided to tidy things up, and remove the stalks. He doesn’t even like garlic or onions. There are many varieties sunk this year. As to whether the clay doesn’t eat them; that remains to be seen. A few others, I forget now! But they didn’t have take their time. They had to be the most pampered, precious plants the world has known. Thanks to Grandad Mike, they were fed, watered and tickled. As tou can see, there was a lot of foliage. 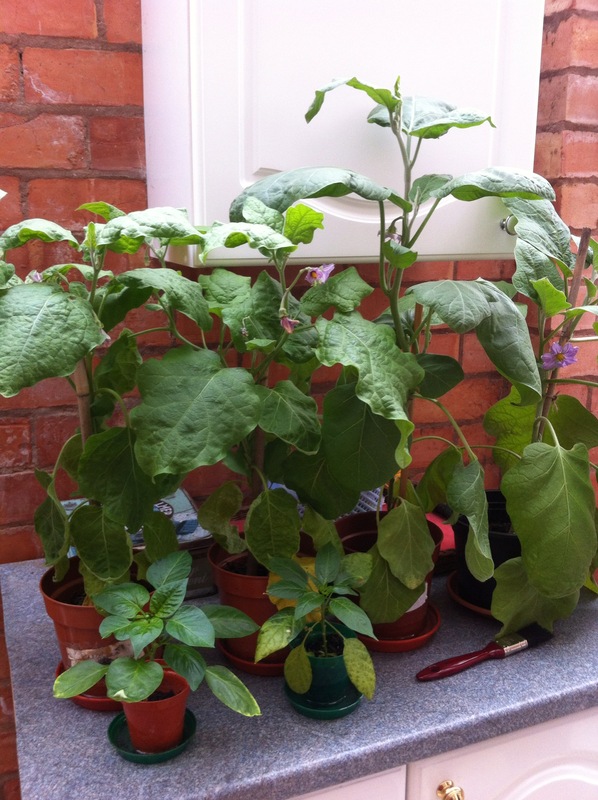 They didn’t leave the utility room; the sun was able to nurture them. Despite the one variety meant to be quite used to the elements, after last years experiment with Kevin, yes, Kevin the moody aubergine. This year was going to be different. The flowers produced were really quite pretty. These were misted and tickled, and still nothing.Not a single aubergine. This could have been down to any one of many things. Perhaps they were pot bound, fed too much, didn’t like the not so tropical environment. I am not at all sure as to which variable caused it all to be such a disappointment. Perhaps I will try again, they seem to grow. Just not fruit. We shall see! This time last year, there was only the one builders bag compared to this years for. At that stage, I had started to collect leaves rather late on. Must have been about late November, and the last remaining few were hanging about. This one bag, was filled with approximately eight to ten bags and these were then left to cook. I think may be once or twice, I may have added some compost activator. I don’t think this did any harm. Taking a matter of months, the leaves decayed and broke down. Forming the dark material that you see wih the magic fork stuck into it. That was summer this year, once I had built the beds; I wanted to fill them. I don’t think, that at that stage it was entirely fully cooked. I have heard variable estimates as to when it is ready to go.So half cooked, it is in the raised beds. Covered with newspaper for some protection against flying weed seeds. The one builders bag, filled four 1m x 1m beds. So all in all, that is quite a lot really. Not bad at all for a first time experiment. This year, there are four beds. There are also more beds. With 12 beds in all, they will all need filling. This year, as soon as the descent of the leaves started; I was collecting. Well, it was mostly Dad and and Grandad Mike, but that’s technicality. Between us, 13 bags a week were collected and taken to the plot. These were then emptied into builders bags and also the raised beds. I have yet to understand the fill science of what actually goes on. I think the breakdown is bacterial, and the decay is facilitated by moisture. I really couldn’t tell you the exact details! So whilst the raised beds are part filled, next year, the aim is to fill these with compost. The builders bags may well be used to top these up. 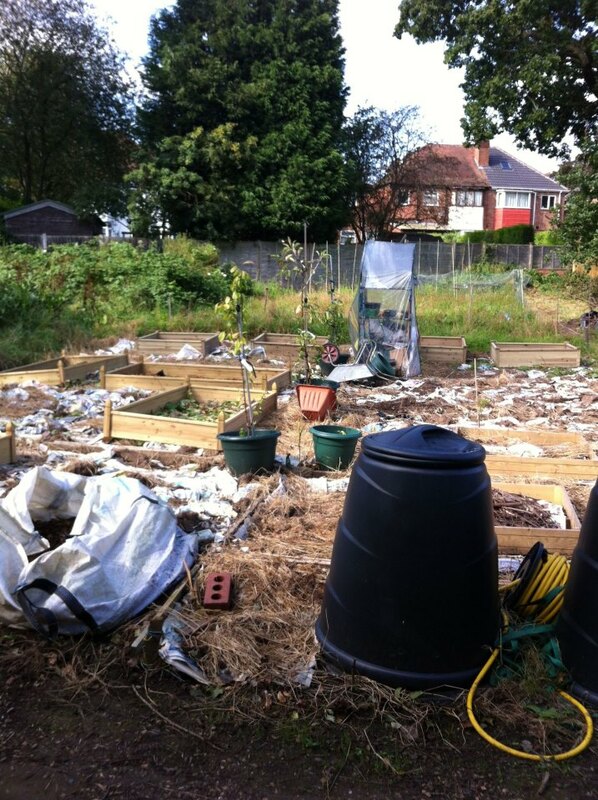 However, the plot being heavy clay; the area not covered with raised beds may benefit from it somewhat. That is, however, if it doesn’t say water logged. What day was it now? Thursday. The day that the heavens opened, the sceptred Isle saw a nation wide band of precipitation cut a swathe through the land. It is still going today, it may well be a different system actually. I forget now, incensed as I am. And why, am I so angry? Below is the reason why. I wandered down this morning, me, my red wellingtons. Dad’s words that I should at least change into my scruffy jeans before I go, ringing in my ears. I fully anticipated it not to be there. I envisaged, that the Wendy house would actually be half way across hobbitland and require fishing out from somewhere. It was still there. In dire shape, and in several pieces. The broom handles-not quite the two ronnies, I know-were still there. One lay, looking rather sorry for itself behind the wendy house. The others needed rearranging a little. It didn’t take too long, to right the wendy house. It’s big enough, it towers over me a little. Trying not trip, fall and land in the mud, I did manage to pull it up. It’s not sitting firm, but sitting as squarely as it can. Tomorrow, there is a further deluge predicted. So it may well end up keeled over yet again. The contents have been entirely disgorged. it was never organised in the first place. So that was tidied up a little. 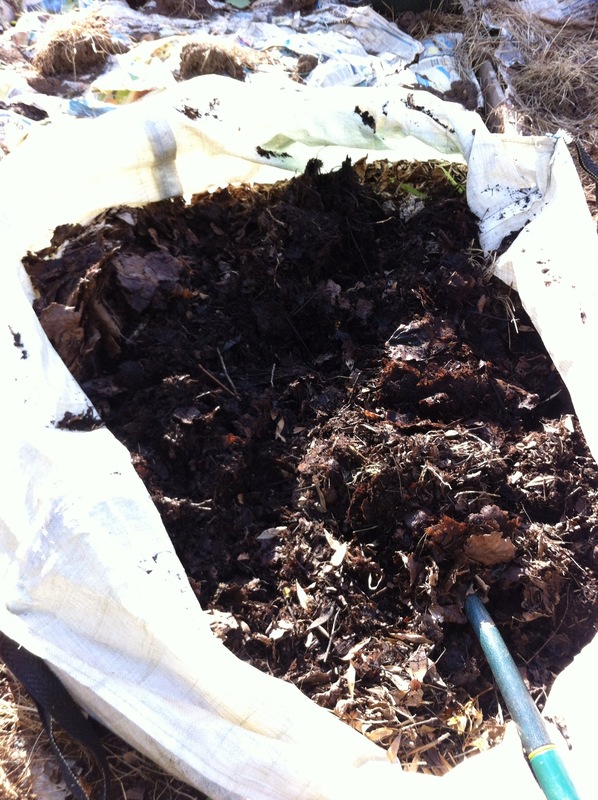 Have moved the bag of compost, and will probably store that in Dad’s shed over winter so that it remains dry. The cover itself, it torn to ribbons. Shredded completely. There are serrated edges, that would suggest the elements have savagely gnawed at it. Chomped on, chewed up, and then spat out. Thankfully, there is a second cover that is somewhere in Dad’s shed. I won’t be putting it on just yet. This wendy house has given me nothing but grief since it first arrived! With the further onslaught from the elements expected, the state of the plot leaves a lot to be desired. That said, on close inspection, green shoots-not many, mind-were observed. Most likely garlic or onions, perhaps the odd spring bulb. However, that means not an awful lot. All those onions, shallots, garlic and tulip bulbs planted are now most likely a write off. 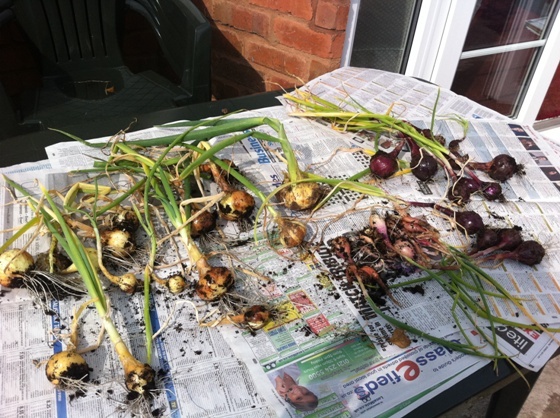 There a few bits of shallots that are sat in dad’s shed; I didn’t get around to planting them last month, and space was getting short. Dear Mother Nature, what exactly is one playing at? Look what you have done now! We’ve had blistering and balmy days earlier in the year, followed by Olympic sport type rain. The situation does not appear to be changing any time soon. As such, it is hard to not be demoralised and despondent. The productivity of this year has left a lot to be desired. With the exception of garlic, onions and shallots, not a lot else has come off. In autumn, at least there is an opportunity to get an early start. With overwintering, it’s a bolt on to whatever you might grown in the spring or summer. Arguably, it can be risky. Especially, if as now, the weather throws you all the curved balls it can muster. Am tempted to get a metre stick, and see just how deep these puddles are. I really would, though the worry is, that I fall in, and will have difficulties coming back out again. Donned the red Wellingtons this morning, to survey the damage done by the over night deluge. A deluge, that has in fact been passing over the sceptred for the last few days. Above and below is the sight that I was met with. Submerged, soggy and really quite slippery under foot. It was a mission to get there, with the path leading up to the plot very boggy. It was not high heel wearing terrain! The half plot is right at the end of the site, and for some time was very unloved. What is evident, is that drainage not just on the plot, but also on that section of the site is an issue. Mine is not the only plot to be somewhere under water. 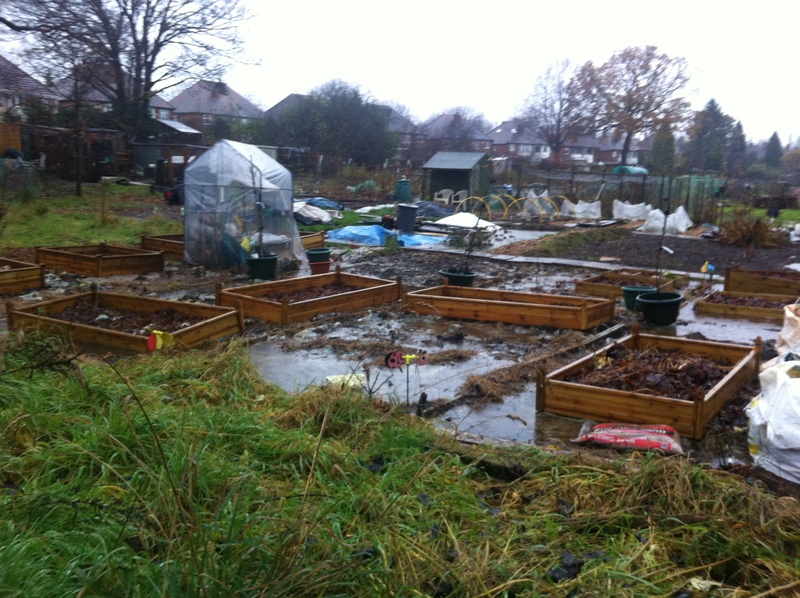 The raised beds are there, in the hope that in being raised; there is a reduced risk of flooding. The ground that does remain, is however going to be sodden. GYO-ing is then severely handicapped. As it stands-the water anyway!-it is difficult to ascertain whether things are drowned, dead and defunct. With the sheer volume of standing water, the persistent precipitation, and the fairly erratic weather; the likelihood is that the clay is going to eat anything and everything. This time last year, it was much drier. The overwintering garlic shallots, onions and even broadbeans had been sown. They were starting to send up shoots. This year, a few had been starting to grow shoots. With the mud and water, any of these are now a little difficult to see. In the cold light of autumn and winter, the plot does look miserable. The one light at the end of the tunnel, would be that by Spring, there could be change. If there is drier weather between now and then, the greedy clay may not get fed so much. This year. 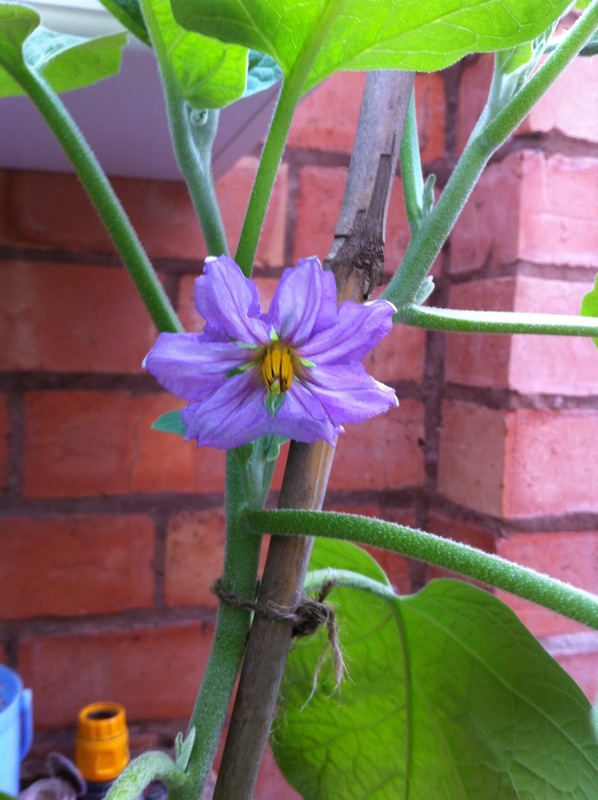 as a first year allotmenteer, has been challenging. It is not just hobbitland, a vast majority of gardeners have faced the same adversities and challenges. And with that, it is no good being morose and defeatist. This year, all being well, has been a fluke. The product of freak climatic conditions. Let’s just hope the water drains! Can’t say that the Autumn term is my favourite, The days start of dark, and end dark, The window of light between these, is incredibly short. Making opportunities to play on the plot fewer and far between. Even more so, when the climate of Blighty plays havoc with your efforts to do something useful. The Autumn is however useful in taking stock, and planning for the future. With raised beds being built during the course of the summer, this will perhaps contribute to combating the challenging nature of the clay soil. Yes, it is full of nutrients. Its lovely for feeding crops. It is however, horribly frustrating. Prone to becoming a bog when faced with a deluge, and then drying out entirely in the dry weather. There has to be strategy implemented to thwart and prevent falling into pitfalls. May have gone slightly overboard with these. The reason for such a variety; is the success of last years over wintering crop. The sheer volume and quality of the garlic in particular, was encouragement to try again. Sowing and then harvesting was really quite simple. That said, the crop may have been lifted prematurely, even if there was rust starting to appear. I daresay that had it been left, the entire crop may have gone to ruin. 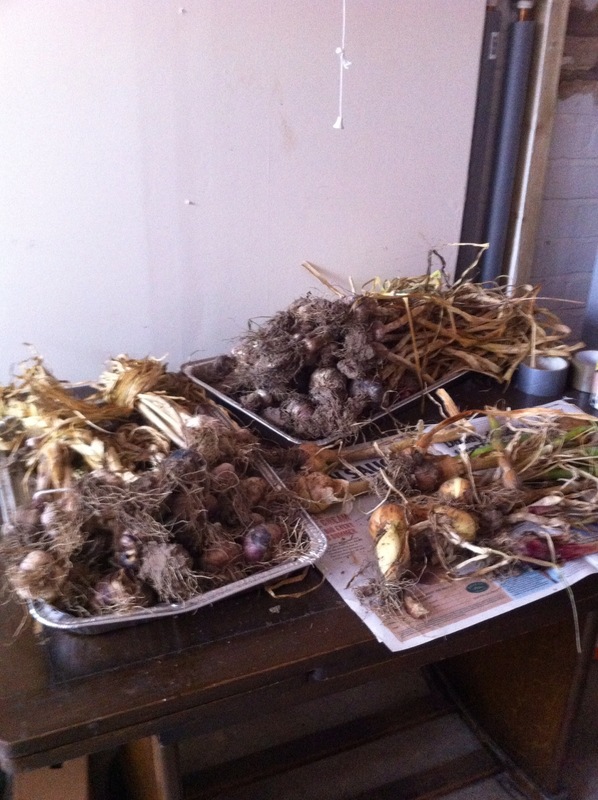 Lifting them, and drying them for a few weeks, led to in excess of forty something bulbs of garlic. I’m at a loss now, remember exactly which varieties were sown. These all varied in the size, flavour and usability There were a great many bulbs that had small cloves. Tiny, fiddly little cloves, that meant a whole bulb could be used for cooking, Other cloves, were fat, flavoursome and packed a punch when used. With the sheer number, a great deal were given away willingly to family and friends. The one comment that most people made, was that it tasted different! Nicer, that is, and the garlic also lasted longer than say the shop bought stuff. There were actually a few bulbs that did actually look as though they wouldn’t look out of place at a supermarket. Yes, shallots have been sunk again. This is despite the numbers that were lost. Unfortunately, in not perhaps weeding the bed as diligently as I could have, this led to many shallots being swamped and squeezed out. The rain and freak weather also caused the clay to eat a great deal. That said, when onions were harvested, some of the larger shallots may also have been lifted! The onions, well, they were okay. Lifted a tad early, as there was horrible weather conditions heralded. Yet, consumed, and enjoyed. A lesson to be learned here, is to perhaps leave them in the ground later still. To also weed the bed, feed and keep a closer eye on them. The red electric onions last year, were smaller, but still nice to eat. A repeated contender this year, perhaps they will fare better. Tulips, Roses: There are a number of different tulip varieties, as well spring flowering bulbs that have been planted. There were a few different varieties that were sunk last year, and despite the wonderfully adverse weather conditions; they mostly survived! The experiment is being repeated this year, and spring flowering bulbs have been sunk everywhere. With last year being very experimental, just to see if anything grew; this year most of the borders have bulbs positioned there. There is actually a colour scheme, with red, white and blue winter pansies and primroses being planted. However, and this is altogether depressing. Many of these have been eaten by those devilish of creatures, slugs. So one is not entirely hopeful about any of these actually coming off. In addition, at the moment; it rains most days. Last year, the autumn and winter was relatively dry.The heavy hobbit land clay didn’t get so boggy. This year, it does seem to be excruciatingly wet. One’s red wellies are caked when pottering around. Suggesting, that whilst things may be sunk; the clay may get so boggy as to eat them all whole. These form a dog leg enclosure on the far side of the plot. The one concern about these, again; is that the clay will eat them. In some vain effort, these have been mulched and will need supervision over the coming season. 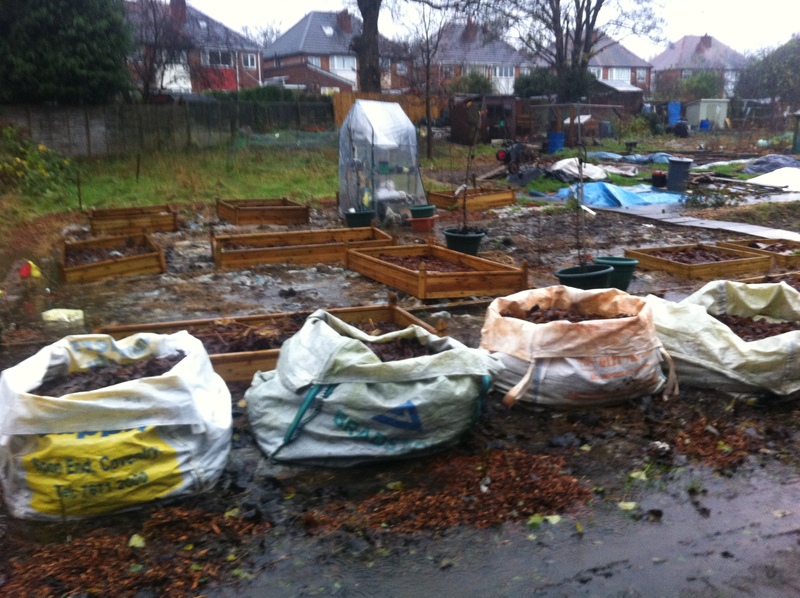 Last year, there was only one solitary builders bag that was filled to the brim with Leaf Mold. This year, there are four! 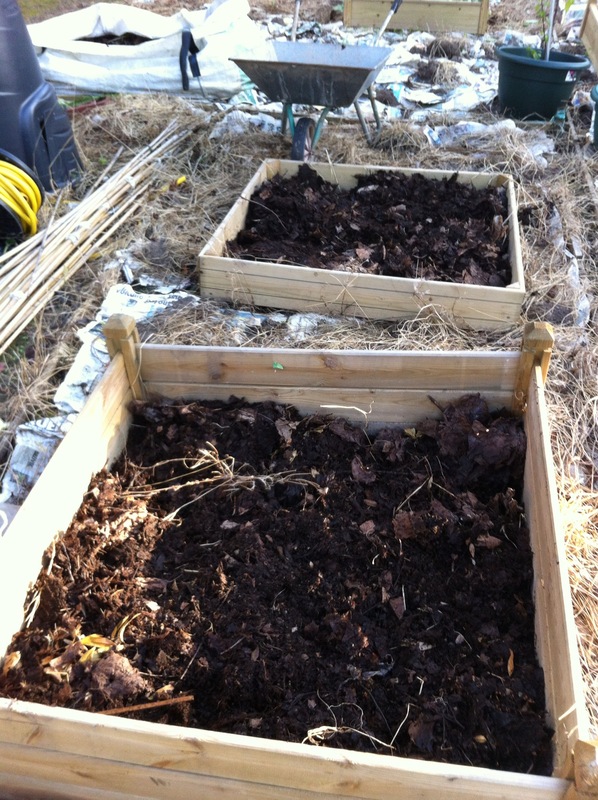 The leaf mold that was garnered from last year has been used to fill a few of the raised beds. For next year, the plan is as follows. Four builders bags have been filled with leaves. In addition, all 12-yes, 12-raised beds have also been filled with leaves. 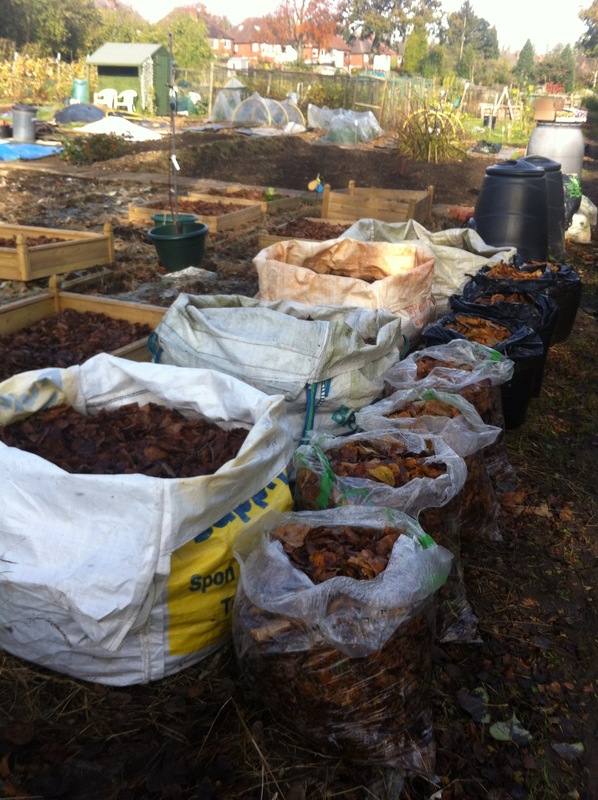 With in excess of 13 bags being filled and dragged down to the plot on a weekly basis, there are a lot of leaves! At least with the raised beds being filled at this point with leaves, as this all cooks down; next year a priority will be to top with compost. I appreciate that for certain crops, that may not necessarily be a good thing. Oh, the woe of British Summer! Whilst we all partied, with the Jubilee, the Olympics and the washout that was the Euro’s. The elements set about doing their worst. 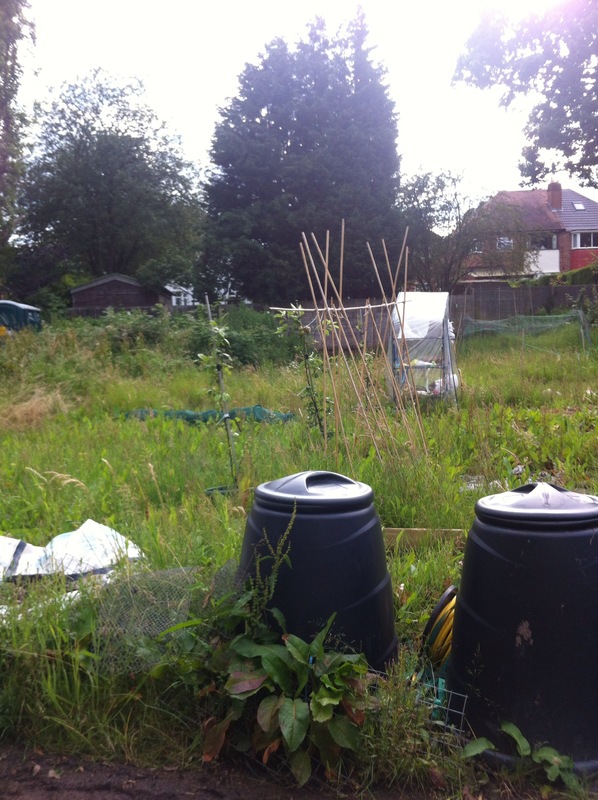 This has to be the worst year for being a new allotmenteer. 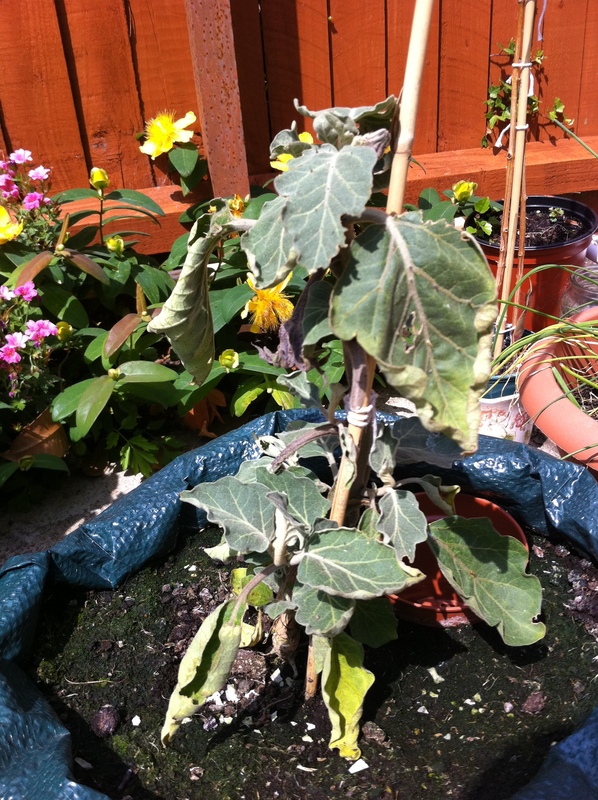 The above image is a testament to what happens, when the weather goes wild, and you fail to get a grip on the weeds. Growing like triffids, the weeds rendered the site a far cry from when it a clear plot last November. The full 88 sqm metres was entirely covered. Demoralised and fairly despondent feeling, there had to be a plan. Or at least half plan. Simple. Weedkiller. There was no way, no how, that I would have been able to clear the plot quickly, efficiently and effectively, Whilst many would shake their heads, tut in disdain and choose not to use chemicals. I did not see any other way. It would allow me to have a blank canvas again and within a relatively short time. So, with a short dry window, the job was done. 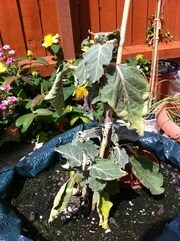 Weedkiller was applied, the weeds taken up. The next stage, was then to think about the naked exposed soil. This is where stockpiling newspaper paid off. The entire half plot was covered with newspaper. The newspaper was then weighted down with dead yellowing weeds. Of course it rained a fair bit, so that also weighed the paper down. These are red and white respectively. It will be interesting to see whether these will come off! There are three cordon fruit trees on the plot. 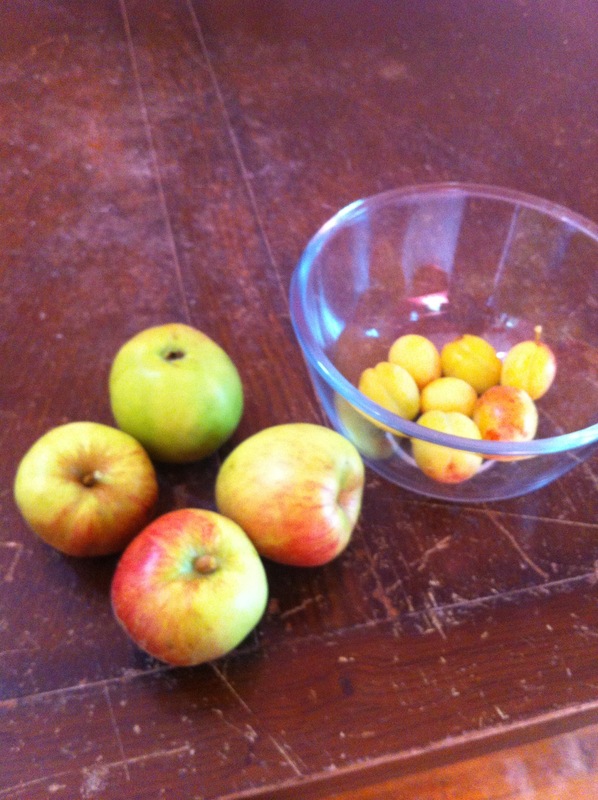 Victoria plum, falstaff apple and concorde pear, The pear, this year failed to produce anything. The apple and plum did all right for the first year! Whilst it was hardly a bounty, the above crop was certainly better than nothing for a first year. Again, harvested early through ignorance. So very, very, very tart! Satisfying nonetheless to see the trees crop in their first year when this is not ordinarily the case.